Hidden off the Buda (Bukidnon-Davao) Highway in the cool-weathered plateau of Malaybalay City in Bukidnon is the largest carnivorous plant nursery in the Philippines, the Pitcher Plant Farm. The farm resort was opened by Volker B. Heinrich, a German naturalist and self-confessed nepenthophile or pitcher plant enthusiast, together with his Filipina wife. The farm is only open to visitors staying at the cozy, solar-powered three-room cabin overlooking the nearby mountains. 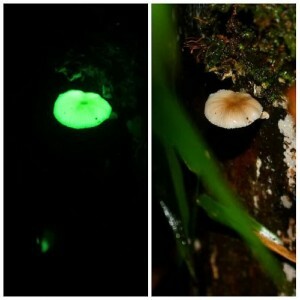 Wild bioluminescent mushrooms (Mycena chlorophos) growing in the backyard! My friend and I stayed at the suite – a family-sized loft-type cabin with a living room, kitchen and big balcony. Despite the gentle rain that began to pour on our first evening, we snuck behind Volker’s house to a rotting bamboo perimeter fence overgrown with grass to observe wild bioluminescent mushrooms (Mycena chlorophos). They reminded me of the glow-in-the-dark stickers of stars that I used to stick on my bedroom ceiling as a kid. The next day, Volker gave a tour of the plant nurseries housing carnivorous plants from around the world. Of course, there were the Nepenthes tropical plant pitchers from across Southeast Asia. But the cool climate of Bukidnon allowed the propagation of North American species that favor lower temperatures such as Sarracenia trumpet pitchers, sundews (Drosera sp.) and Venus flytraps (Dionaea muscipula). There were also bladderworts (Utricularia sp. ), a genus of carnivorous plants that feed on small organisms in freshwater or water-saturated soil with bladder-like traps. Besides carnivorous plants, Pitcher Plant Farm also grows orchids, bromeliads and other ornamental plants. Before we left, I made sure I bought a copy of Field Guide to the Pitcher Plants of the Philippines. On the cover is a photograph of Nepenthes attenboroughii, a large montane species of pitcher plant co-discovered by Volker himself in central Palawan in 2007. As a parting gift, Volker also gave me a few pitcher plant seeds and some instructions to try to grow them back home in Cebu. How cool! Pitcher plant cutttings were a nice touch! HOW TO GET THERE: Pitcher Plant Farm is located at Purok 2, Barangay Kalasungay, Malaybalay City, Bukidnon off the highway connecting Cagayan de Oro City and Davao City. One can only visit the farm if they book at least a night’s stay with them. Unfortunately, they do not accept day trip visitors anymore. There are only three rooms: Garden Room, PHP 1,300; Studio Room, PHP 1,900; and the loft-type cottage Suite for PHP 2,900. Rooms can be booked online, or contact +63 916 4228724 or +63 9129492800. Free wifi available. From Cagayan de Oro, take a bus or van bound for Davao City and tell the driver to drop you off at Purok 2 in Brgy. Kalasungay near Kalasungay Elementary School (. Look for the dirt road with the yellow signage that leads “To Barangay Covered Court”. From here, it’s a 400 meter walk to Pitcher Plant Farm (Just follow the signs). Or you can pre-arrange a pick-up with the farm for PHP 100 per group. Home-cooked meals are available at PHP 200 per head. But you can very well bring your own food, or cook in the kitchen. Luminous mushrooms – wow! Been to Bukidnon twice but haven’t heard of this place yet. Ang ganda.